After a finish, I’m always more open to inspiration and color. I’m always drawn to navy and yellow. The green is a leftover obsession from the last quilt. When I saw these in the store, I just knew I had to have them. I love and hate that feeling. But I knew it was time for a new project and so I justified a little jump start to the process with fabric inspiration. And so I brought them home and pulled from my stash until my eyes were pleased. 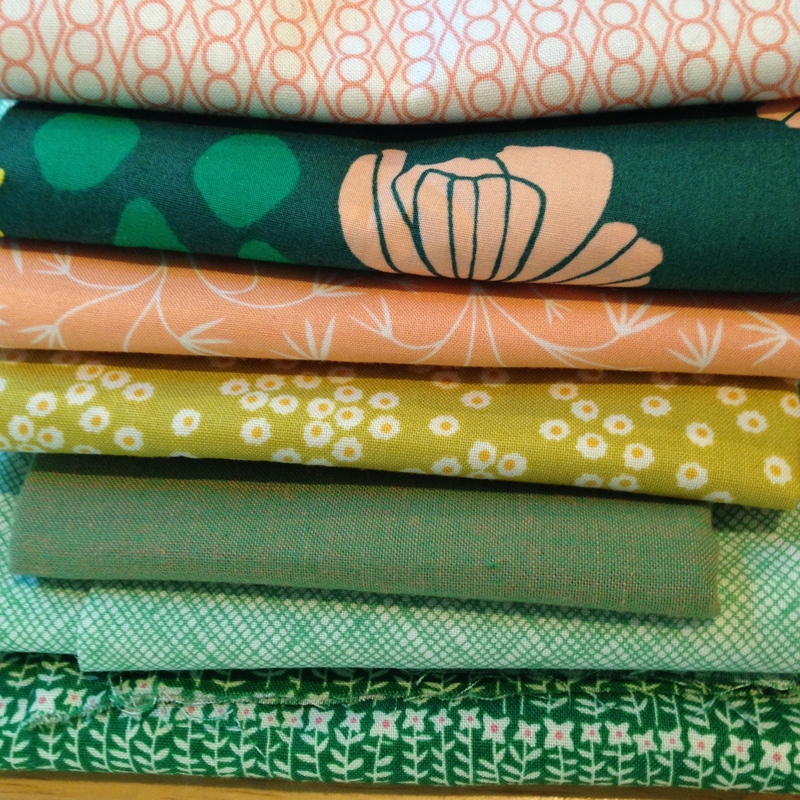 Some of the fabrics were just calling to be used– my neglected peachy pinks and a coveted half-yard of bold Meadow that I bought in Nashville among them. I still really enjoy green, but I thought that the peach and yellow would bring some novelty and brightness to the table. The Andover cross weave has both green and peach– and by the time I noticed that it was meant to be. It just clicked. And the new fabric was just the key. Here’s the stack for my next quilt. 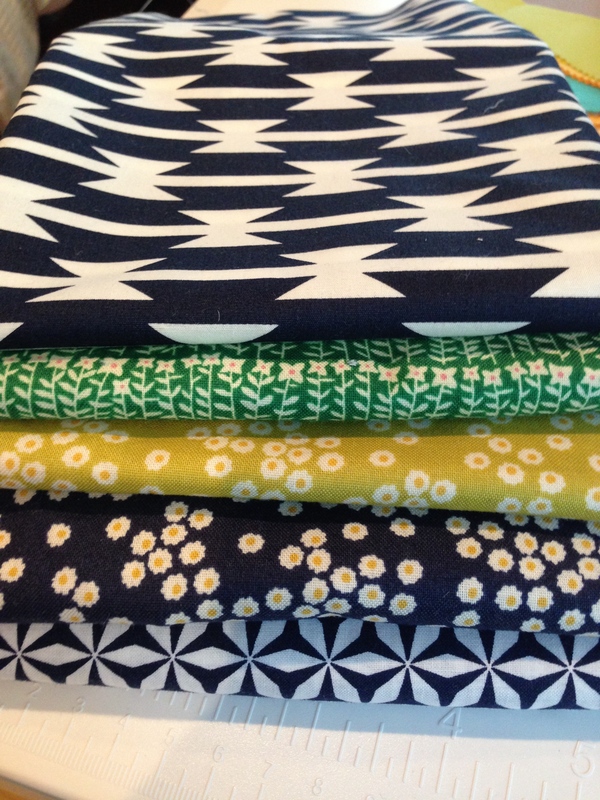 From top to bottom, fabrics are from Catnap (Andover), Meadow (Art Gallery), Grey Abbey (Cloud 9), Petite Fleur (Windham), Andover cross weave, Botanics (Robert Kaufman) and Petite Fleur. And there it is, a new bundle and a new plan. A super-quick baby quilt tutorial, coming to this space very soon. A quick self-promotional announcement: If you’re in the northern New Jersey area, I’m starting a new five-week session of Beginning Quilting this Wednesday, July 9 at Rock Paper Scissors. Visit the store’s website for more information or call to sign up if you’re interested. I bought a yard of that meadow print in Nashville, too. I love the other prints you have paired with it. Looking forward to the tutorial! Those peachy colors are perfect with the greens and blues! Great eye.